A group of kids are being honored for going above and beyond to make sure a 5-year-old boy with special needs had a birthday to remember. Erica Byfield reports. A group of skateboarding "superheroes" were honored for making sure a 5-year-old boy with autism had a birthday celebration to remember. 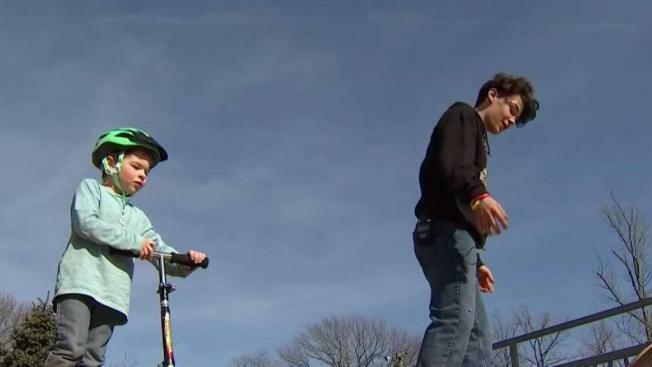 Kristen Braconi brought her son Carter to a skate park in South Brunswick, New Jersey on Tuesday as a treat for his birthday, Braconi told News 4. Carter, who has high-functioning autism and ADHD, was riding a scooter around when a group of older kids showed up. "The bigger kids started showing up, and Carter kind of said, 'Oh no,' and he thought he was going to have to leave, because, you know, he's little, and he thinks that bigger kids don't always want to play with little kids," Braconi said. But Carter was mistaken, much to his delight. The kids gave Carter an impromptu skateboard lesson, and even picked him up when he fell. Braconi caught the touching moments on video. The kids also sang "Happy Birthday" to Carter. "It was so nice," Carter told News 4. "They sang 'Happy Birthday' to me!" Braconi felt so overwhelmed by the kids' compassion that she shared the videos on Facebook — and her post went viral. "It's hard to teach kindness. It's something that you can't teach, you just hope that you convey the message, and it's keeps going," Braconi said. Her post inspired South Brunswick police to put out a post of their own, in hopes of identifying the kids. "These kids showed the care and compassion of Superheroes," the department tweeted. "We want to throw them a little pizza party to recognize their Superhero status. If you know who they are contact Lieutenant Gene Rickle." LOOKING TO FIND SOME SUPERHEROES - On Tuesday some older kids turned into superheroes right behind police headquarters. Police were soon able to locate the kids who'd been so kind to Carter. Within hours, the department was planning a pizza party; police officers also handed out "challenge coins" to the kids. "These people have done something exceptional," South Brunswick Police Lieutenant Gene Rickle told News 4. "I think it's great that they did such a great thing for this kid that they didn't even know." One of the kids shared some advice with News 4. "Be nice to others," Gavin Maves of South Brunswick said. "You never know." "As a parent, you always worry when there's no parent watching, that they're on their best behavior and doing the right thing," his mom Donette Maves said. "And that made me proud."